The new resources will support the delivery of training this month to Aboriginal marine rangers during 2018 as part of the nationally accredited Certificate III in Fisheries Compliance. The training and assessment resources, such as guides and teaching materials, would assist in the collection of a wide range of reliable scientific data and biological samples for fisheries management and scientific research purposes. Fisheries monitoring and compliance activity assists in the protection of the Northern Territory’s (NT) aquatic environment, recreational and commercial fishing sectors and enhances the economic opportunities for aquaculture. This work will have measurable benefits in terms of surveillance and collection of samples for potential aquatic pests and disease including fish kills events. Qualified Aboriginal sea rangers work alongside NT Fisheries and NT Water Police in managing aquatic environments. This complements the traditional roles and responsibilities of Aboriginal people living along the coastal areas of the NT in the management of their sea country. NAILSMA is an Aboriginal led not-for-profit company operating across northern Australia and works to assist Aboriginal people in managing their land and sea country sustainably for all future generations. 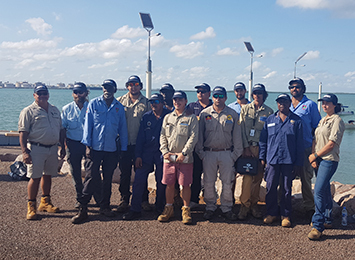 Successful completion of this compliance training will enable graduates to be appointed under the Fisheries Act as Fisheries Inspectors (class 1) and builds on the Aboriginal Community Marine Ranger Program.